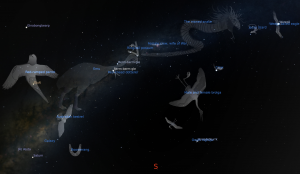 Stellarium is an open-source planetarium software program that simulates the sky from any place on Earth (or other planets), at any time. 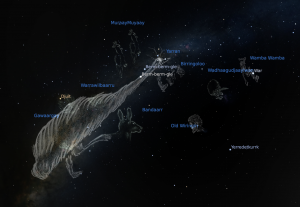 It features plug-ins for viewing constellations form a range of cultures, including Aboriginal Australian. Currently, two Aboriginal communities are available in Stellarium: Boorong and Kamilaroi. The Boorong are a clan of the Wergaia language group in the northwest of Victoria. Some of their traditional astronomical knowledge was collected and published by the Englishman William E. Stanbridge in the 1850s. In the 1990s, historical John Morieson began researching these old documents and attempting to reconstruct the larger body of astronomical knowledge. He worked closely with astrophotographer Alex Cherney to develop constellations for Stellarium. These draw upon the papers of Stanbridge, but also include some of John’s personal interpretations. The package is now standard in Stellarium. The Gamilaraay, also called the Kamilaroi are an Indigenous Australian people whose lands extended from New South Wales to southern Queensland. They form one of the four largest indigenous nations in Australia. Some of their traditional astronomical knowledge was collected and published by Robert Fuller in 2014 and 2015 for his MPhil degree. He worked closely with a number of Kamialroi and Euahlyi elders and community members, including Uncle Ghillar Michael Anderson. Fuller and Uncle Ghillar worked together closely to develop constellations for Stellarium. This package was part of the ‘Giving Back’ of the collected knowledge to the Kamilaroi and Euahlayi communities in the form of a documentary video (Star Stories of the Dreaming) and a student Study Guide. Clips from the Stellarium were used in the documentary to illustrate certain sky objects.